Three Boxed and encapsulated sets of commem. Mt. Rushmore Proof coins from the US mint 1991. There are two of the three coin sets, and one two coin set. 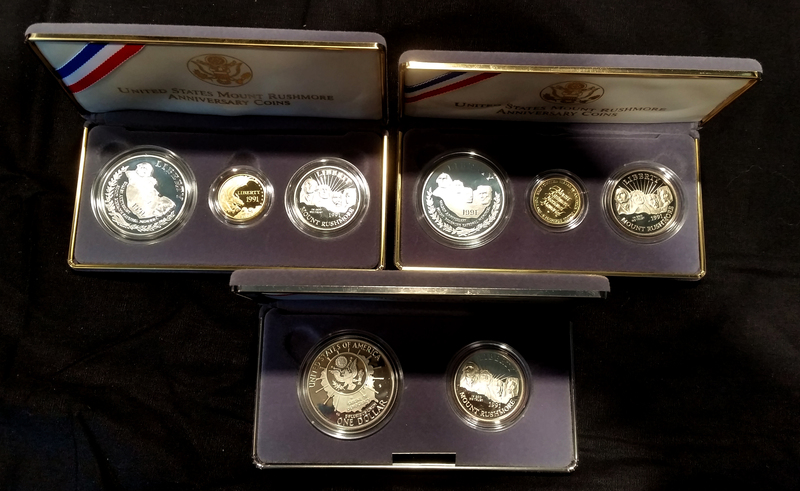 Each Three Coin Proof Box holds: Gold Five Dollar (0.24 Troy Oz ), Silver Dollar (0.76 Troy Oz ), and Clad Half Dollar The Two Coin Proof Set Holds a Silver Dollar (0.76 Troy Oz ), and Clad Half Dollar.